Everyone at some time has wanted to throw a pie in someone else's face. 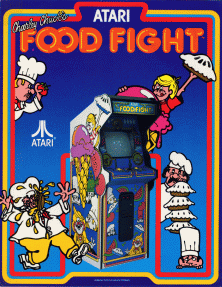 Now coin-operated game players have the chance with ATARI Food Fight, the only video game of its kind in the world. The player, as Charley Chuck, must dodge all kinds of flying fruit and vegetables and try to eat an ice cream cone before it melts. How many ice cream cones can he eat? Your players will soon find out in this incredible video feast. As an ice cream cone melts on the other side of the screen, Charley Chuck just naturally has to go for it. But he must get past Oscar, Angelo, Jacques and Zorba, four chefs who unexpectedly pop out of holes, chase Charley Chuck and throw food at him. They all have different personalities and they're all out to stop Charley Chuck if he isn't fast enough. If Charley Chuck gets to the ice cream cone in tine, he can eat it and move on to a new game level and a different flavor of ice cream. But if he is hit or caught by one of the pesky chefs, all the food on the screen flies at him and he loses a life. (yuk!) There are piles of tomatoes, peas, bananas, pies and watermelon Charley Chuck can use to defend himself from the persistent chefs. Each food acts differently when thrown (and Charley Chuck never runs out of watermelon ammo). When Charley Chuck hits one of the chefs, the chef turns the color of the food that hits him and disappears (ever see a watermelon chef?). Soon another chef pops up in his place, so Charley Chuck never gets a rest. As well as throwing food at them, Charley Chuck can lead them into the holes in the playfield where the chefs appeared, cause them to fall in and disappear. But he must be careful not to fall into a hole himself. A special feature exclusive to new Food Fight is the Instant Replay. If Charley Chuck has a close call and is nearly hit by food, an instant replay of the action will occur, accompanied by the Food Fight musical theme. Players can select to start at higher game play levels, too. If less than 15 seconds has passed since the last game, the player can choose to start a new game at the level where he left off. The operator may select from among 4 different level select settings, offering the player up to 125 game levels. Foot Fight is fun for kids 6 to 60. You'll clean up profits while your players have a ball making a video mess.